A Thanksgiving centerpiece is like the front window of a boutique. It should be inviting and giving guests a hint of what is to come. There are a lot of wonderful ideas from which one can choose from, according to the overall Thanksgiving dinner style, the used tableware and the general interior design and decoration of the house. Thus, it can be elegant, traditional, natural, fun, formal and so on. While flower markets are a little less colorful in the colder months, you shouldn’t make your table suffer because of that. Choose flowers that are in season to add a wow factor. Create a centerpiece with berried branches, tiny pumpkins, and leafy greens. Tuck these into a wooden bowl to make a showpiece that spells autumn. Decorated pumpkin decor can set the tone for a lovely table spread. Embellish your pumpkins with fresh flowers and candles. To make your centerpieces last past thanksgiving, replace the fresh flowers and pumpkins with silk flowers and faux pumpkins. Attach the flowers to the pumpkins with hot glue before you add the candles. You can use the centerpieces throughout the year or store them for next thanksgiving. So simple and yet so cute looking! Just fill a few cylindrical vases with birdseeds or nuts, in order to keep the branches standing nicely. Take some good looking mini pumpkins and suspend them with twine. Now arrange them to hang on the branches and over an arrangement of other seasonal items, like pine cones, berries, branches, more pumpkins and candles. Try making an eye-catching centerpiece, arranged with seasonal flowers and fruits, using autumn tones. Firstly, choose a beautiful, natural, wooden container to use as a vessel or you can make your own, by attaching birch bark on the sides of a pine box with heavy-duty staples. Next, line the box on the inside with some heavy duty plastic and add floral foam, in order to support the flowers. Use any suitable flowers, berries, branches and fruits, even vegetables in colors of your choosing. For an elegant centerpiece for the Thanksgiving table, use a nice, slim wooden box and arrange in it some small or mini white pumpkins and small white flowers, like tiny roses and white calla lilies. A few pheasant feathers or some other matching decorations give this arrangement the final twist. A centerpiece that is not too overwhelming, simple to make but remains a wonderful assembling, is the following one. Arrange some beautiful autumn leafs, pine cones and berries around matching candles. Use different sizes and types of fall candles and candleholders, which match with the placemats and napkins that will be used, and you will have a beautiful arrangement. 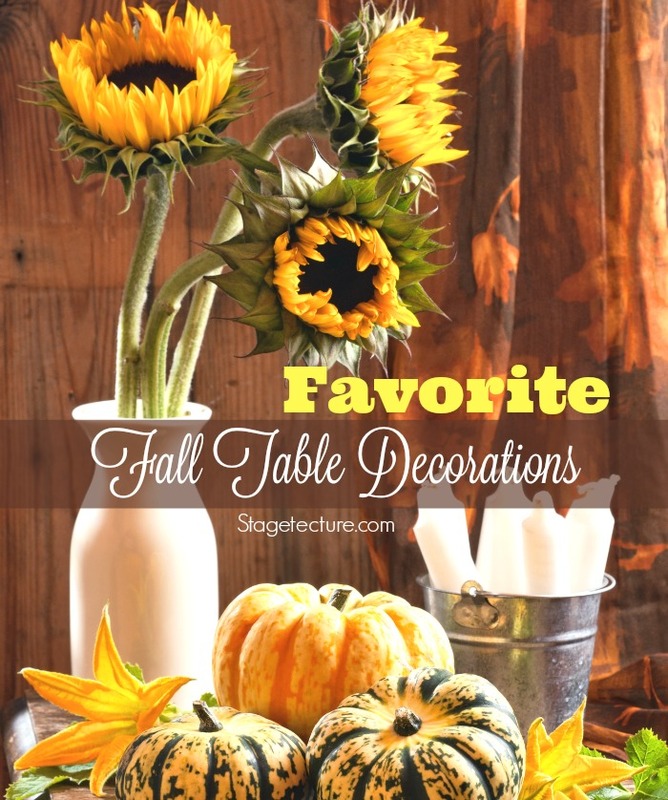 We love these fall table decorations on Stagetecture, too! What better way to show your love for the season than to create a centerpiece comprised of your favorite autumn herbs? Herbs smell great and can bring to mind fond memories. To create your thanksgiving centerpiece, fill a glass vase with different types of herbs like rosemary, thyme, and sage. If your container is small, you can create several centerpieces and arrange them at the center of the table. If you have an eye for texture and color, head to the vegetable aisle of your local grocery store. Here you’ll find purple cabbage, curly lettuce, artichoke, kale, and other colorful vegetables. You can arrange them on a shallow footed tray and surround it with floating candles. You can also remove the center of the cabbage and replace it with a jar of water or florist’s foam and put a few blooms inside. A fun, very natural and original idea is to take a gathered tree branch and use it as a tea light candleholder by drilling some holes into it. This inexpensive idea can be completed by arranging nuts, leafs, various pumpkins, pinecones and flowers on the side of the branch. It will for sure be a special Thanksgiving centerpiece that would be ideal for an outdoor Thanksgiving table! Everyone likes having a place at the table, just ask the kids when they get older and make it to the “Big People” table. Make everyone feel special this Thanksgiving evening with specialized table toppers. Pick any fruit, nut, pumpkins or paper craft of any item that represents the holiday and take little strips of paper, write the person’s name on, place each of those strips in the item and place them around the table next to the plates or in front of them. Not only will this add to the ambiance but make everyone feel included and for kicks you can add little quotes or jokes to the strips of paper for each person. 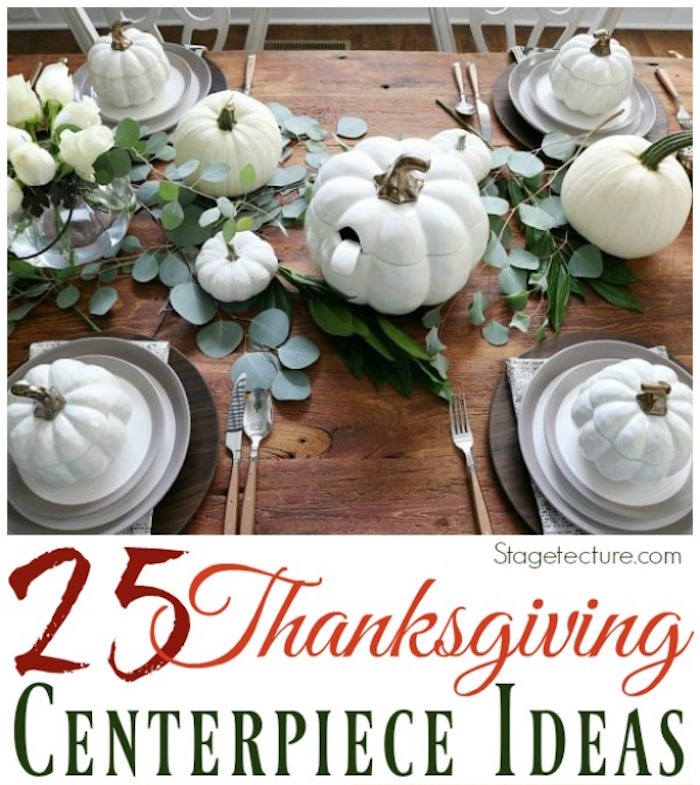 15 Blogger Thanksgiving Centerpiece and Fall Ideas We Love! The possibilities for creating a stunning centerpiece are unlimited. Draw inspiration from nature’s colors and use its gifts that are abounded this time of the year. You can also get ideas from your home surroundings and available decoration items and tableware as well. If you then put a great amount of love and care into this creation, it will for sure be a hit among your loved ones! Need Thanksgiving leftover ideas? We have a whole bunch for you! 🙂 Browse these Thanksgiving leftover recipe ideas on Stagetecture.